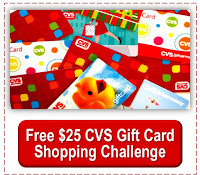 I had a $4 ECB expiring, so I went looking for some good deals to use it on as part of my $25 CVS Gift Card Challenge with my free $25 CVS gift card from Swagbucks. I decided on the Suave and pencils deals, but after coupons that only came to around $1.50, so I also picked up some of the tissues that were on sale-less than half price!!! The Suave counts towards CVS Beauty Club (spend $50 get $5 ECB). This is shopping trip #16 in my CVS gift card challenge. My $25 CVS gift card earned on Swagbucks plus extra bucks and cash back earned on purchases made with it total $26.76 worth of CVS spending power. See the spread sheet below for details of my current totals. The mechanical pencils will be packed into Operation Christmas Child shoebox gifts this Christmas. We shop all year long to help us be able to pack dozens of boxes for kids in need.